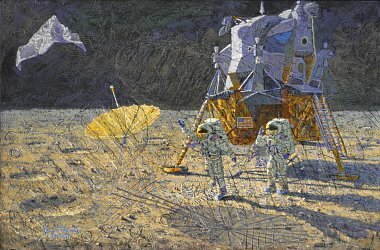 In order to accurately depict Apollo scenes, events and images in my paintings, I meticulously constructs physical scenes using models of astronauts, the lunar module, the moon rover and Surveyor. 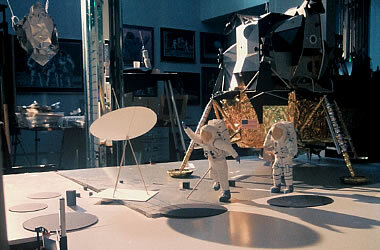 NASA's official moon photos are studied so that the craters and moon rocks are placed where they should be. A special studio light is positioned so that the direction and length of the shadows are exactly as they would have existed on the moon. My preparation for a new painting is almost as meticulous as the training for my own moon landing.